What do we want? Deep-timbred bold free-soloing Americans. When do we want them? This May! 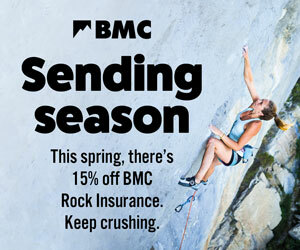 That’s right, the BMC is bringing Alex Honnold to the UK for Flying Solo, three unique events that promise to be as captivating as his virtual onsight and subsequent solo of Gaia. So what’s on the cards? If you’re wondering who we’re on about, and why we’re boiling over with excitement, Alex Honnold is a Californian rock climber who is famous for making free solo ascents of big walls, breaking speed records, and more recently, demolishing marathon alpine traverses such as the Fitz Traverse which is documented in the movie A Line Across The Sky. That’s why we can’t wait for Alex to get here and for the fun to start. At the shows, we’ve got rock-star Alex Honnold mixed in with our ambassador team: including Steve McClure, Hazel Findlay, Shauna Coxsey, James McHaffie and Calum Muskett. Each event will be hosted by Niall Grimes, with book signings, Q&A sessions, raffle and spot prizes. 24 May: Abbeydale Picture House, Sheffield - SOLD OUT!! 25 May: Comedy Store, Manchester - SOLD OUT!! 27 May: Beacon Climbing Centre, Caernarfon - SOLD OUT!! These events are now all sold out. Please remember to bring your membership card to the event or risk having to pay the extra on the night. Special guests will include BMC ambassadors Steve McClure, Hazel Findlay, Shauna Coxsey, James McHaffie and Calum Muskett, all perfectly heckled by funnyman Niall Grimes. Alex will also be doing a booksigning before the talks (6 - 7pm), so come along nice and early for a chance to meet him. We've got spot prizes and raffle prizes from the The North Face, the Depot Manchester, The Climbing Works and The Beacon. Long live the king! The UK’s best sport climber has put to bed another project at Malham, proving that this iconic crag is far from climbed out. BMC ambassador Steve McClure named the new route ‘The Reign Is Over’ and reckons it’s around 8c in difficulty. We caught up with Steve to find out more about the route, its name, and how it climbs. The world’s first Youth Climbing Symposium is coming to the UK this November! The day brings together leading coaches and climbers from around the world to coach the youth of the UK at one of the most modern climbing centres in the country. For the past ten years, the IFSC has devoted itself to the development, regulation and promotion of Sport Climbing competitions around the world. So many athletes, National Federations, event organizers, officials, sponsors, media and fans have contributed to the successful growth of the organization and our sport. As usual, no events in London. We're afraid that Alex is flying in to Manchester en-route to Ireland, so didn't have time to head down south. Hello.. What time is the event likely to finish please? Looking at booking train tickets back to Nottingham!